Fidget spinner are over and done. Fiiiiiiiinally. You’ll still occasionally see a kid playing with one if he or she hasn’t gotten the message yet, but most people have moved on at this point. What have they moved on to? We’re glad you asked. There are a few different fidgety toys that people play with these days, but our favorite have to be the liquid motion toys that are popping up all over the place now. They’re actually revivals of old toys from decades ago, but you know what they say: everything old is new again. There are a bunch of different options out there when it comes to cool liquid motion toys, and you’ll find two of our favorites under $10 below. This liquid timer makes the perfect fidget toys, office desk toys and even as classroom rewards. Like a stress ball used for hands, these are perfect as adhd toys for gentle visual stimulation. 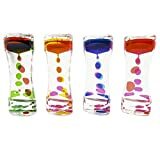 This adhd timer adipose stress toy has two bright colored drops that rain down slowly when flipped, almost like a lava lamp or hourglass sand timer, making them fun children activities kids toys. Bubbler measures 2″ wide x 5.75″ inches in length. This listing is for 1 bubbler per order. Each bubbler contains two colors inside. Yours will be selected at random from our in-stock supply. Great for Party Favors, Birthday Gifts, Birthday Giveaways, Holiday Gifts or Favors, Easter Basket or Egg Stuffers, and much more! ONE PER PACK: When purchasing this item, you will receive 1 bubble timer of the ASSORTED COLORS. 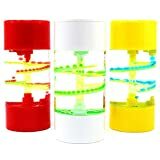 Watch how the bubbles travel down the spiral ramp and be calmed!! STRESS RELIEVER – This item is a great STRESS RELIEVER!! The MESMERIZING effect of the bubbles will keep you and your kids ENTERTAINED for hours!!! FOCUSING TOOL: Great for children with SENSORY and HYPERACTIVITY issues. The rhythmic effect of this bubble timer helps children with SPD and ADHD calm down and stay focused for a longer amount of time. GREAT FOR ALL AGES: This item is one of those that can be enjoyed by ADULTS and CHILDREN alike. Great for keeping on your Desk, on the Dresser in your Room, or on your Kitchen Counter… In short, wherever you think it might come in handy.